Bringing It Together in a Four-Foot Kitchen: Chicken Mole Wraps – Eat Me. Drink Me. On my silence, let me say this: Moving boxes, painting walls, working 8-hour days, and scouring a city for an extension cord or two is time consuming. I’ve barely been eating, much less writing about eating. Rice with ketchup was about as gourmet as it got. (Moment of silence for the sadly defunct Gourmet.) But all that is changing. I’m moved. My walls are orange. My clothes are hanging. My desk is bigger than it’s ever been. I am ready to go buy groceries. Well. I was ready to buy groceries. And then I realized that I don’t know where to buy food in New York City. Think about that for a second. One of the biggest, most delicious cities in the country. And there’s not a normal grocery store for miles. Sure, there’s Whole Foods, if you want to spend $8 on an eggplant grown in a local, sustainably organic hydroponic cave. Or Trader Joe’s if you want a fist sized, shrink-wrapped head of lettuce you can only buy after waiting in a twenty minute line. There are specialty shops in midtown and unmarked bulk bags in Chinatown, ethnically-themed markets and bulgar-tempeh-tofu kingdoms, but all I really wanted was a comprehensive grocery store that wasn’t going to break the bank at item number three. And then I thought – maybe I’m being a little too suburban right now. Maybe this is the chance for my foodie self to show some mettle. So I’ll buy the giant log of goat cheese for $5 at Trader Joe’s and my Illy espresso at Whole Foods. And I’ll buy my rice and nutmeg in Chinatown and my meat from the store down the street called “Meat.” I mean, it just takes time to grocery shop. And it’s not like I have to finish unpacking any boxes or commute to work or do the dishes. It’s just time. And then I thought – stop complaining. Start cooking. In honor of my new neighborhood, I decided to make a chicken mole. The Bushwick/East Williamsburg area where I live is a low-income, half Hispanic/half Hipster neighborhood where the closest grocery store to the right sells organic celery root juice for $5 a bottle and the closest grocery store to the left has bars on the door. Bravo is an exciting little store – you have to dig through the Oreos and Ramen, but there are tons of great things I’d never find in my suburban grocery – like chicken feet, cow’s feet, pig’s ears, cans of octopus in olive oil, corn husks, coconut water, and the entire line of Goya products. I kept the pork neck in mind for later, but picked up a jar of mole (a thick chocolate chile sauce), some onions, and cilantro to add to the spices I had at home. Thinking that my kitchen’s inaugural meal had to be shared, I called my neighbor to see if she’d want to help me cook. Being a like-minded spirit when it comes to eating, she hopped over from her apartment two doors down bearing a bag of tortillas, incidentally also from Bravo. 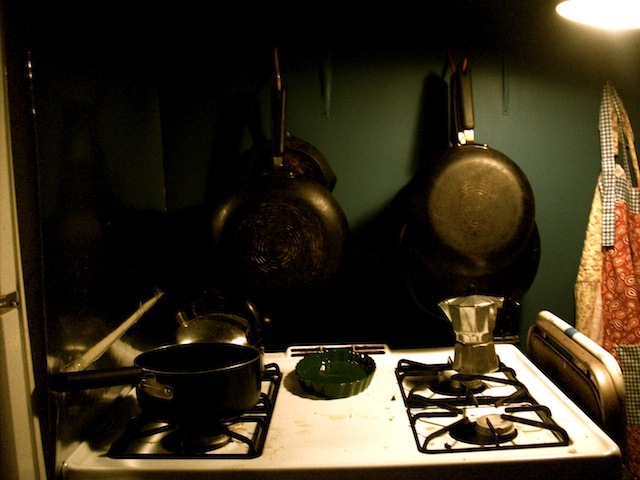 The kitchen was certainly small, especially for two bustling people, but soon the smell of onions, cumin, and coriander turned cramped into cozy. We glanced at a recipe for chicken mole I’d found, but ended up playing it by ear with amounts and procedure. Some garlic would be good? Ok. More salt? Ok. I unpacked a half-gone bottle of Captain left over from those wild college days, and we drank sips of chilled rum out of vintage green tumblers while we added dashes of this and that to the skillet, and the sounds of chicken sizzling in oil mingled with the footsteps in the apartment overhead, a drum, a plane taking off from JFK. I chopped cilantro and cut up a few limes as we tasted our mole. It was good – and had a nice, lingering heat, but it was lacking a little punch on the tip of the tongue. I rummaged through my spices, figuring that out of the hundreds of random bags and bottles I’d find something suitable. Remembering an excellent sausage pasta I’d made earlier that was both sweet and spicy, I added a liberal dash of Berbere spice and honey. Berbere is an Ethiopian spice mix which usually contains chile peppers, ginger, cloves, coriander, allspice, rue berries, and ajwain, and my honey was from the Tennessee mountains. And on top of that, I’m German-American and my cooking partner is from Norway. That, my friends, is New York in a nutshell. So my kitchen is christened. My skillets and spatulas have a home, the brie has its place in the corner of the fridge as does the flour, and all the knives have gotten a good sharpening. I live with people who like to eat and like to cook. They might still sigh when they trip over that big box in front of the door – but I’ll just give them a taco and tell them it’ll all be cleaned up soon. The inspiration for this mole came from the May 09 issue of Bon Appétit. But since we didn’t measure anything, I’ll just sort of lay out the groundwork for this recipe – feel free to make it your own. Ended up getting about 9 burritos out of this recipe. Sauté chicken in oil until just cooked through and nicely browned. Meanwhile, bring about one cup (maybe even one and a half cups) water, bouillon cube, and orange juice to a boil – add chicken and simmer. In a skillet, sauté onion until translucent. Add almonds, garlic, cumin, and coriander. Remove chicken from broth and shred it finely. Add broth and jar of mole to the skillet with the onions and mix it up until the consistency is thick but fluid. Think less wet cement and more mud puddle (is this a bad comparison for food?). Here’s where you get to exercise intuition, since you’ll have to add a combination of broth (so don’t add all the broth at once) and olive oil to the skillet to get the right consistency. Anyway. When the consistency’s right, add the raisins, oregano, honey, berbere, and salt. Guess I should have mentioned that all this time, you should be making some rice. 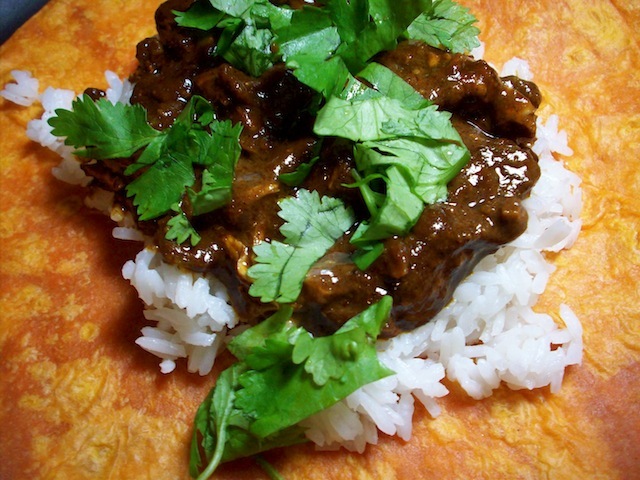 Throw your tortillas over the burner for a few seconds and then top them with rice, mole, lime, and chopped cilantro. hm…any good vegetarian recipes/that sounds delicious. It all sounds wonderful and delicious. Congratulations on your first mud puddle Big Apple meal! what marvelous and delicious things you create! It’s a joy to read your blog.